1. For the pastry, place all the ingredients except the stem ginger into a food processor and whizz until you have a coarse crumb. Add about 3-4 tbsp cold water and blend again until the mixture comes together to form a dough. 2. Knead on a lightly floured surface, add the stem ginger and carefully knead again until the dough is flecked. Wrap in clingfilm and chill for 30 minutes. 3. Preheat the oven to 200°C, gas mark 6. 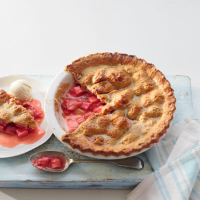 Toss the brown sugar, cornflour and rhubarb together and arrange in a 1-litre pie dish (about 22cm diameter x 3cm deep). Drizzle over 2 tbsp ginger syrup from the stem ginger jar. 4. Roll out the pastry on a lightly floured surface and place on top of the pie, trimming away any excess. Bake for 25 minutes until golden and crunchy. Sprinkle with caster sugar, if you wish, and serve warm with vanilla ice cream.